It raises over the place that was the Church of the Dominicans of the 13th century. 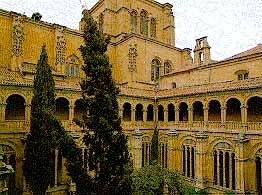 In the 16th century, the Cardinal Juan Alverez of Toledo ordered the construction of this piece which is notably better, for the grandeur of its order. The construction lasted from 1,533 to 1,610, passing through several architectural tendencies and ending in a monumental temple of a Latin Cross in only one nave with simple forms which matured in the cimborrio (its dome). Its most interesting factor is seen in its façade. The Gate is one of the purest examples of the renaissance architecture of the last third of the 16th century. The church is a prototype created during the reign of the Catholic Kings.